02035.org - Blog - Welcome To Foxborough, MA, USA! Home Of The Warriors & The Gem Of Norfolk County! This site is an unofficial site about the town. Apr. 24 Around Foxborough | #NERevolution, Coffee & Conversation With #Foxborough_MA Town Manager, Fun With S.T.E.M., Senior Supper Club, Feel Good Yoga, Hearing Health, Bridge Club, Colorists Club, Pool, Mindfulness Meditation, A.A., 9 Ball Pool, 5-Stand, And More! Apr. 25 Around Foxborough | Human Trafficking Summit, Marine Corps Wine Dinner, @MASSCruisers, Mommy & Me, Art With Allie, Women's Bible Study, A.A., @UUFoxborough Mindfulness Group, Book Club, Boy Scouts, Municipal Meetings, And More! Find more information about the runners and race day via: Boston Athletic Association. Where: Race begins and ends at Schneider Electric, 38 Neponset Avenue, Foxborough, MA 02035. Cost: Pre-Race $25; Day of $30. T-shirt to first 200 registered. 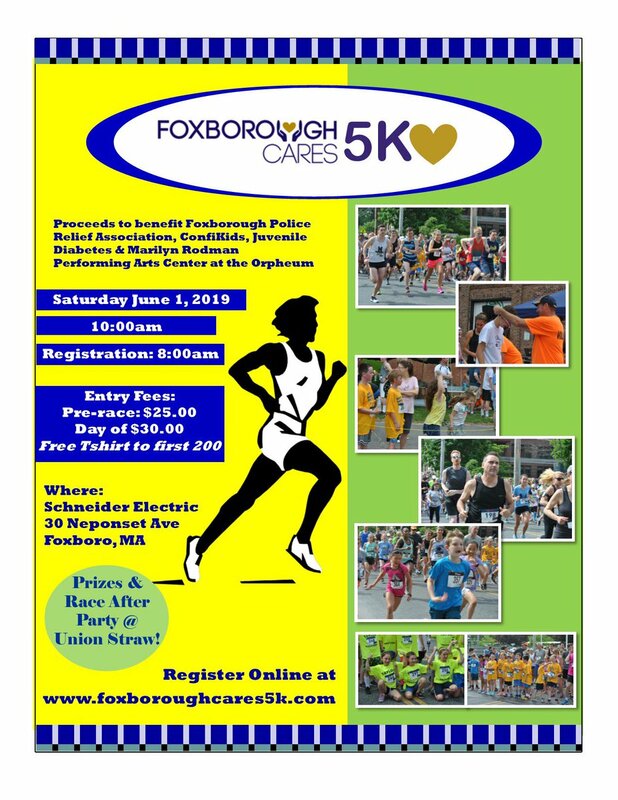 "Awards: 12 & Under, 13-18, 19-29, 30-39, 40-49, 50-59, 60+, 1st, 2nd, 3rd Place, Male & Female Divisions"
Race benefits Foxborough Police Relief Association, @ConfiKids, Marilyn Rodman Performing Arts Center, and Juvenile Diabetes. Bib Pick-Up and Race-Day Registration begins at 8:00 a.m. on June 1, 2019. * Check with venues before proceeding. You are invited to join the Peace Vigil from 6:00 p.m. - 7:00 p.m., on Thursday, April 4, 2019, at Foxborough Universalist Church, UUA. Everyone is invited to participate in the ongoing peace vigils - please show up during the hour and stay as long or as short as your schedule allows. There will be spoken and silent meditation in addition to a sign explaining what the peace-vigilers are doing. UUFoxborough is located at 6 Bird Street (on the common/Route 140) in downtown Foxborough; directions to the church and more information about the First Thursdays Peace Vigils can be found through http://www.uufoxborough.org. Area residents are welcome and encouraged to participate! December 2018 marked the 12th Anniversary of Foxborough Universalist Church, Unitarian Universalist Association (UUA) Social Action Committee's First Thursdays Peace Vigils. In April, 2003, the Foxborough Universalist Church, UUA lit the Peace Candle that sits in the front window of the church and serves as a symbol of the congregation's continued prayers for peace, especially in Iraq. In the Fall of 2006, the church's Social Action Committee began the First Thursdays Peace Vigils and the community of vigilers have stood in front of the church with peace candles and signs once a month since then. The plan was to continue until the war in Iraq was over, but it has continued to this day because troops are still deployed in the region and peace has not yet been achieved. December 2017 marked the eleventh anniversary of the First Thursdays Peace Vigils and the community of vigilers is still going strong. The group has fluctuated in numbers over the years, but it's members are always appreciative of newcomers, pedestrians interested in the vigil, and the numerous honks and waves of support they receive from people traveling by the common every first Thursday of the month from 6:00 p.m. to 7:00 p.m. If you're interested in finding out more about this endeavor or the community of vigilers, please contact LeeAnn via office@uufoxborough.org or firstthursdayspeacevigils@uufoxborough.org or stop by sometime between 6:00 p.m. and 7:00 p.m. on a First Thursday. Area residents are welcome and encouraged to participate! Some famous Universalists, Unitarians, and Unitarian Universalists born this month. Professor, Author, Peace Advocate. She was the first female Moderator of the the American Unitarian Association [AUA] in 1940, served as President of Mills College from 1916-1943, in 1945 was a delegate to the founding meetings of the United Nations in San Francisco, and also served as president of the American Association of University Women. "Let us not forget that the future includes more women in the ministry than we have ever known before." She had been the longtime member and president of the Fragment Society. The society, founded in 1812 by some of Boston's most prominent women, is believed to be the oldest sewing circle in the city and members pool their sewing skills to repair old clothes for donation to the needy. She also served as president of the Herb Society of America and lectured widely on the propagation and uses of herbs. Social reformer, teacher, mental health advocate, and humanitarian. Helped pass a bill for the enlargement of the Worcester Insane Asylum, Union's Superintendent of Female Nurses during the Civil War, and author of Remarks on Prisons and Prison Discipline in the United States. Politician, Presidential Elector for CT in 1940, CT delegate to Democratic National Convention in 1948, Governor of Connecticut 1949-51, served as U.S. Ambassador to Nepal 1951-53 and India from 1951-53 and 1963-69, U.S. Representative from CT 2nd District, 1959-61, and U.S. Ambassador at large from 1961-63. Minister, Librarian, Humanitarian. She was co-founder of the Czech Unitarian Church, was ordained as a minister in 1926, introduced the first Flower Communion Service to America in a spring 1940 celebration at the First Unitarian Church in Cambridge, served as Minister in New Bedford during the early 1940's, and joined the staff of the United Nations Relief and Rehabilitation Agency and worked from 1944 to 1950 helping displaced persons settle in Yugoslavia, Egypt, and Palestine. Politician, Member of Massachusetts state house of representatives from 1970-72, member of MA state senate 1972-84, MA Democratic state chair 1977, MA delegate to Democratic National Convention in 1980, and U.S. Representative from Massachusetts 5th District, 1985-93. Unitarian Minister, "The Blind Preacher", educator, author, and hymn writer. In 1814 published Deerfield Collection of Sacred Music. Sculptor who received his first commission in 1873 from the town of Concord for the statue "The Minute Man" and is most noted for the sculpture of "Abraham Lincoln" in Washington, D.C. which was completed in 1922. Psychiatrist and professor who helped enact the "Briggs Law", appointed Superintendent of St. Elizabeth's Hospital from 1937-1962, was an active member of the USC, and served as AUA Moderator from 1946 to 1948. "Don't take yourself too seriously. Be tolerant of the peculiarities of others. Try to do something worthwhile in your life and observe the Golden Rule." Worked for women's suffrage, one of the first women elected to the Boston School Committee, worked to establish the Latin School for Girls, founder and president of the New England Women's Club, and during the Civil War headed the New England branch of the Sanitary Commission. Lawyer, Politician, U.S. Representative from Massachusetts, and U.S. Ambassador to Canada. Author of "A Vindication of the Rights of Woman" in 1792, advocated social and educational equality for men and women, and mother of Mary Shelley. On April 22, 1781, at Pennsylvania University, Elhanan Winchester gave his first sermon publicly advocating Universal Restoration. In April, 2003, Foxborough Universalist Church lit the Peace Candle that sits in the front window of the church and serves as a symbol of the congregation's continued prayers for peace, especially in Iraq. In the Fall of 2006, UUFoxborough's Social Action Committee began the First Thursdays Peace Vigils and the community of vigilers have stood in front of the church with peace candles and signs once a month since then. Please support this ongoing effort by joining the vigilers sometime from 6:00 p.m. - 7:00 p.m. any first Thursday. 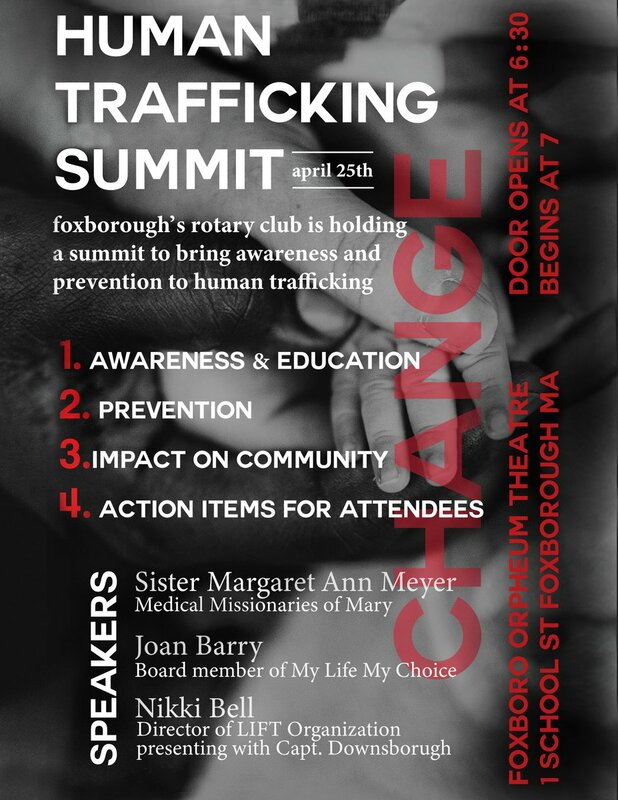 April 24: #NERevolution vs. Montreal Impact at GilletteStadium 7:30 p.m.
April 25: "Human Trafficking Summit" by Foxborough Rotary Club at Orpheum/MRPAC. April 27: Clean-Up Foxborough Day 8:00 a.m.
April 27: Lions Club Bottle and Can Drive Benefitting FHS Tennis Team at Foxborough Town Hall. April 27: NAC Super Hero Dash & 5K 9:00 a.m.
April 27: Drug Take-Back at FPSB 10:00 a.m. - 2:00 p.m.
April 27: South Foxborough Community Center Members Pot-Luck Supper. April 28: Community VNA�s 6th Annual Spring Break at @Lakeview45. April 28: FRD's Spring Photo Shoot Fundraiser 9:00 a.m. - 2:00 p.m.
May 1: Scouting Information Night at @FoxboroughRCS 6:00 p.m.
May 2: First Thursdays Peace Vigil at @UUFoxborough 6:00 p.m.
May 3: Improv Soup at @BurrellElem 7:30 p.m.
May 5: Jim Scott at @UUFoxborough 2:00 p.m.
May 6: MAS Fubd-Raiser at Foxborough Country Club 8:30 a.m.
May 7: Bingo at Foxborough Senior Center 1:30 p.m.
May 11: @FoxboroughPS Elementary Schools Clean-Up Day. May 11: #NERevolution vs. San Jose Earthquakes at GilletteStadium 7:30 p.m.
May 14: Foxborough Senior Olympics Begin. May 16: Friends Of Boyden Library Book Sale ends 5/18/19. May 17: Foxborough High School at The Artist's Studio & Gallery at Patriot Place ends 5/19/19. May 18: Foxborough Street Painting Festival at @PatriotPlace 9:00 a.m. - 6:00 p.m.
May 18: Jaycees Spring Vendor and Craft Fair on the common. May 19: Rent by UnCommon Theatre Company at Orpheum. May 25: Yard Sale at @UUFoxborough 9:00 a.m.
May 25: Softball Tournament at Booth ends 5/26/19. May 25: #NERevolution vs. D.C. United at GilletteStadium 7:30 p.m.
June 4: Blood Drive at @BrighamWomens 9:00 a.m. - 3:00 p.m.
June 8: Foxborough Founders Day! June 8: The Rolling Stones: 2019 No Filter Tour concert at #GilletteStadium. June 15: Monster Jam at @GilletteStadium. June 14: Improv Soup at @BurrellElem 7:30 p.m.
June 21: Luke Bryan: Sunset Repeat Tour 2019 / 2019 New England Country Music Festival at GilletteStadium. June 22: Dead & Company Summer Tour 2019 at Gillette Stadium. June 26: #NERevolution vs. Philadelphia Union at GilletteStadium 7:30 p.m.
June 29: #NERevolution vs. Houston Dynamo at GilletteStadium 7:30 p.m.
July 3: FinishAtThe50 at PatriotPlace. July 20: "The Super Mega Ultra Giant Mad Decent Block Party Festival" at @GilletteStadium. July 21: "The Super Mega Ultra Giant Mad Decent Block Party Festival" at @GilletteStadium. October 5: October Road at Orpheum/MRPAC.